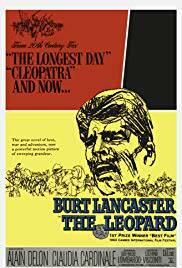 The Leopard is a 1963 Italian epic period drama film by director Luchino Visconti, based on Giuseppe Tomasi di Lampedusa’s novel of the same title. Sicily, 1860. The corpse of a Royalist soldier is found in the garden of the villa of Don Fabrizio Corbera, Prince of Salina. As the Prince’s large family enjoys the customary comforts and privileges of an ancient and noble name, including private services with their Jesuit priest, war has broken out between the King’s army and the insurgent volunteer redshirts of Giuseppe Garibaldi. Among the rebels is the Prince’s remarkably handsome and dashing nephew, Tancredi, with whose romantic politics the Prince shares some whimsical sympathy.